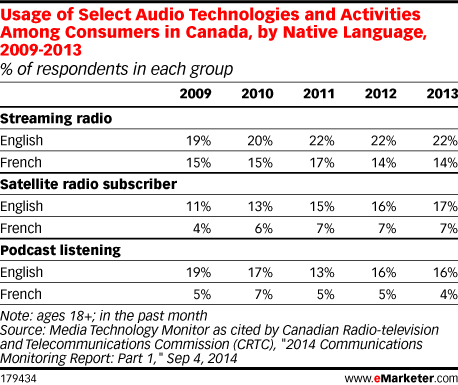 Data is from the September 2014 Canadian Radio-television and Telecommunications Commission (CRTC) "2014 Communications Monitoring Report: Part 1." CRTC and Statistics Canada collect data from CRTC's annual broadcasting returns and telecommunications data collections forms, from additional sources including Statistics Canada, Industry Canada, company-specific final reports, Numeris (formery BBM Canada), BBM Analytics' Media Technology Monitor (MTM) reports and information filed with the CRTC for regulatory proceedings. Broadcasting data is from the 12-month period ending August 31, 2013.